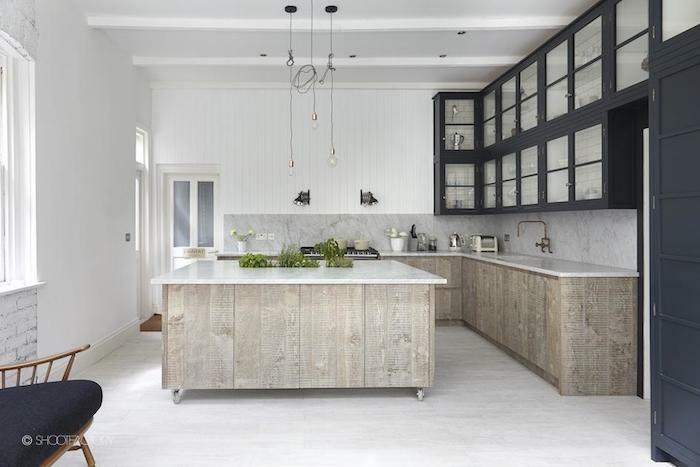 This industrial kitchen is designed by Blakes London. It has timber panelled doors with contrasting with dark charcoal cabinets. The subway tiles make a gorgeous appearance through the glass framed wall cabinets. The details are elegant in this industrial kitchen. The centre island is movable and has a herb garden built into it. The marble bench top extends into the splash back and is contrasted by vertical white wall panelling. The lighting, tap ware and appliances all add to the industrial charm of this kitchen. We love this one!